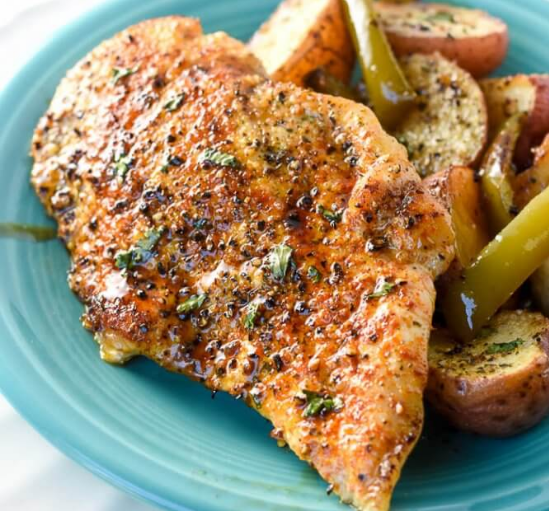 Brush chicken breasts with 1 tablespoon olive oil. Season all sides of chicken breasts with salt, pepper, garlic powder, paprika, and rosemary. In a large cast iron skillet over medium-high heat, add 1 tablespoon olive oil. When hot, add the seasoned chicken to brown. Cook for about 2 minutes. Turn and cook for another 2 minutes. If you are using a cast iron or oven-safe skillet, place the skillet with the chicken in the preheated oven and bake at 400 degrees F. for 20 minutes. If your skillet is not oven-proof, transfer the chicken to a baking dish. When the chicken is cooked, remove from oven, and let rest for about 10 minutes.